Please try iPhone/iPod touch if you are visiting here with them. If you are using adequate browser, please run the program on sub-window and try with reading follow article. 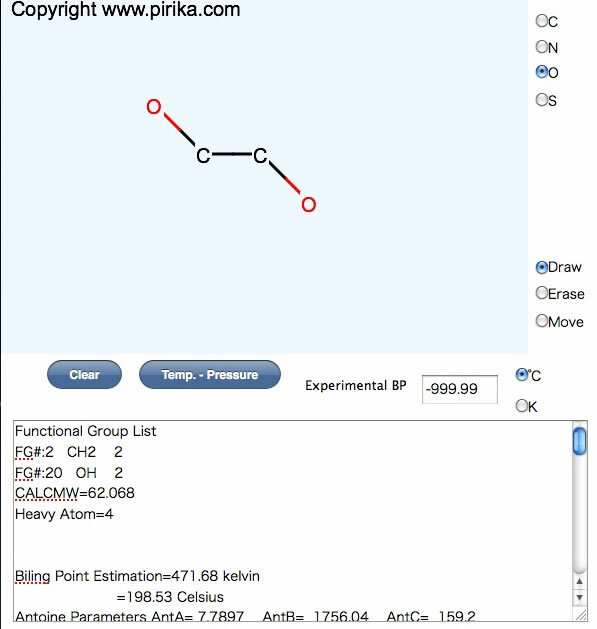 If you draw Ethylene glycol and push Temp.-pressure button, then program break molecule into Functonal Groups and estimate various properties. If you enter experimental boiling point, program use it and accuracy will increase. 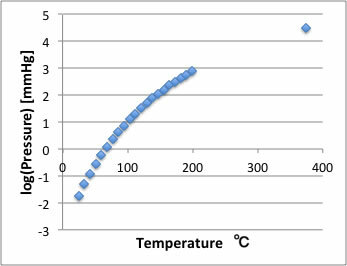 Estimation of Boiling Point is 471.68K, and exdperimental value is 470.45K. So the accuracy is very high. If you paste this result into spreadsheet and you can easily draw diagram. The rightest point is critical point. 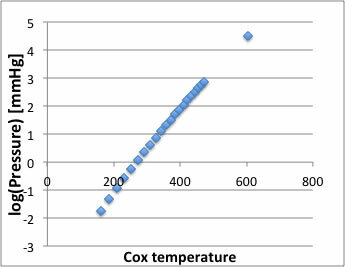 In this table, second column is Cox-temperature. 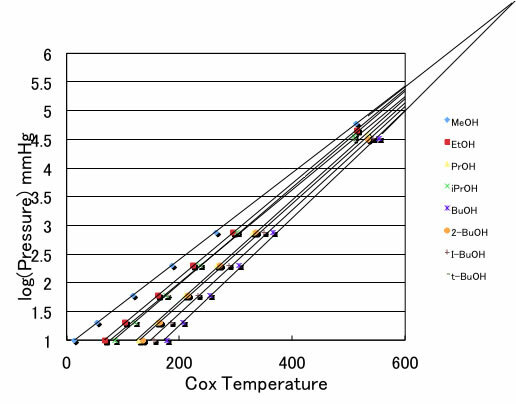 if you plot Cox temperature vs log Pressure, the diagram become line.You can do these calculation with only molecular structure. 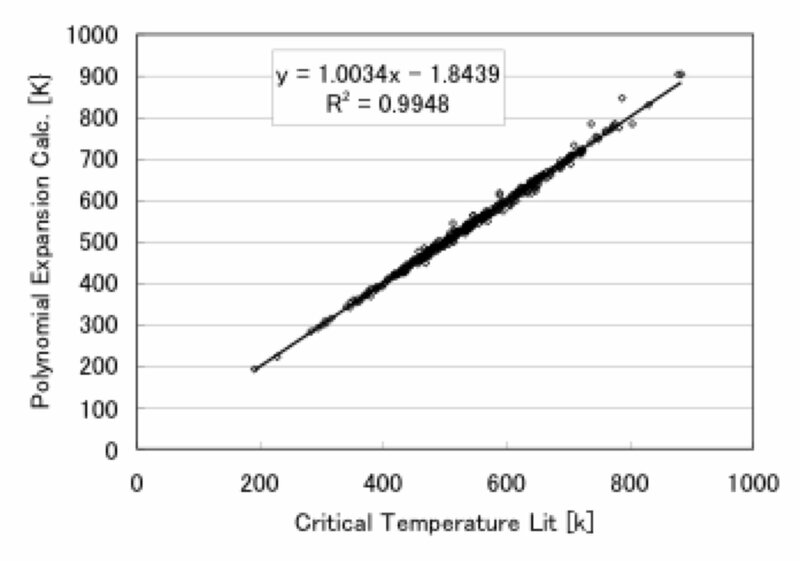 These boiling point and critical point is very important properties to estimate other thermo chemical properties with using Corresponding State Theory. But even very excellent database Dipper-801, very few experimental critical data are available. We can experiment only small compounds because molecular size become large, then Critical temperature become above 700C, and stability of molecule is not certain at such temperature. So, a lot of estimation scheme are developed like Joback method. But still very difficult to estimate large molecules. 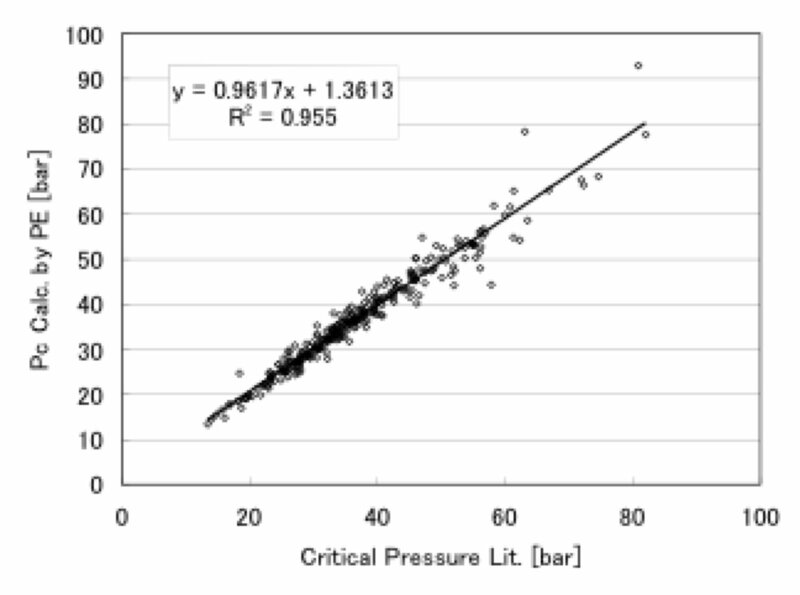 if you plot Cox temperature vs log Pressure, the diagram become line. 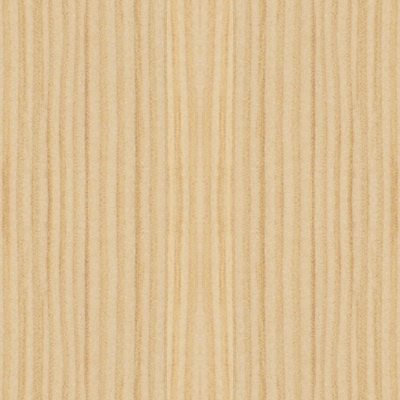 And the same type of molecule (Alcohol for example), every lines meet at one point (Cox point). If I magnify around Critical point, almost all critical points are on the line of Cox-VP lines. 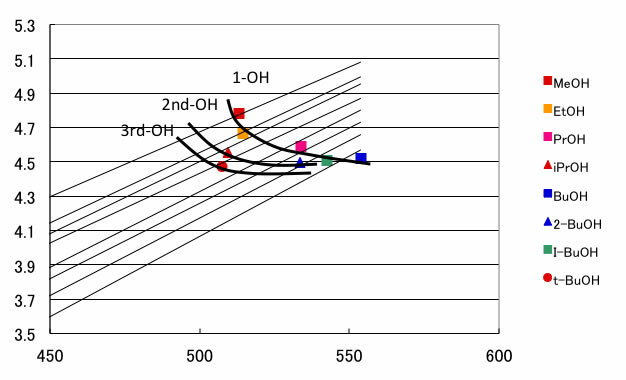 And from this result, I can estimate Critical point from Antoine parameter with molecular shape index of ovality. With these new method, I can estimate Critical point very accurate. 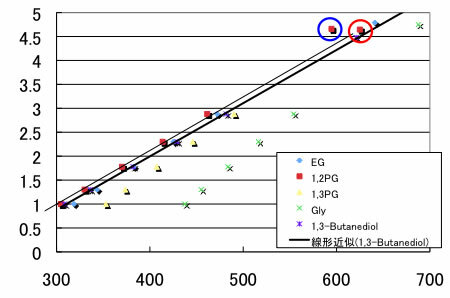 1,2-propanediol have no critical point data. I estimate Group Contibution method(Blue circle point) and new method (Red circle). Which data, do you want to use?